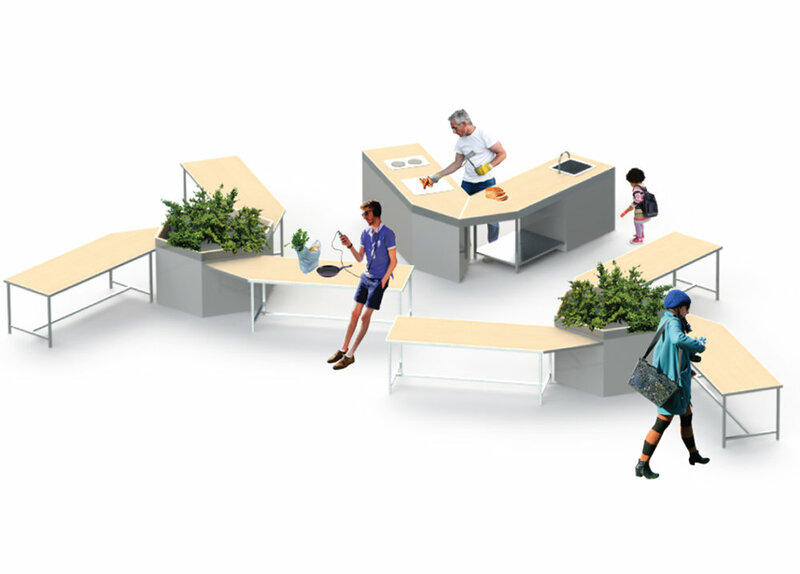 This project examined whether the practice of an industrial designer can influence an informal and inherently amateur activity like Tactical Urbanism – or how a formal design approach can respond to social issues in the public realm through diverse, scalable exercises. To explore this, the designer and PHD candidate, Amber Sauni, looked at social issues relevant to the local area, which led to those sleeping rough and how they access food. Amber came to identify that on a local level, food security had primarily been tackled in a short term sense through provision of free meals, or free or low cost grocery items. Amber was able to establish that the crux of the issue lay in the lack of sustainability and autonomy that comes with single serve free meals, and the issues associated with preparing raw ingredients without appropriate, accessible kitchen facilities. Conceptually, the Movable Feast was intended as a response to the needs of the homeless community and the desire for a system which may be realised through an ethos of dignity and autonomy. Research revealed that displaced people had created their own systems to combat food insecurity. By pooling their resources and sharing the collaborative results, many people could benefit through a higher quality end product, with less waste and less personal output. Limitations within this system were in the lack of public food preparation facilities – the primary means of cooking came from public use BBQs, which precludes cooking in pots and pans, or heating liquids. The result of this is that many inexpensive, nutritionally dense foods aren’t able to be adequately prepared by those most marginalised. The Moveable Feast was based on the hypothesis that food insecurity may be interrupted by inserting a food preparation device into current systems. 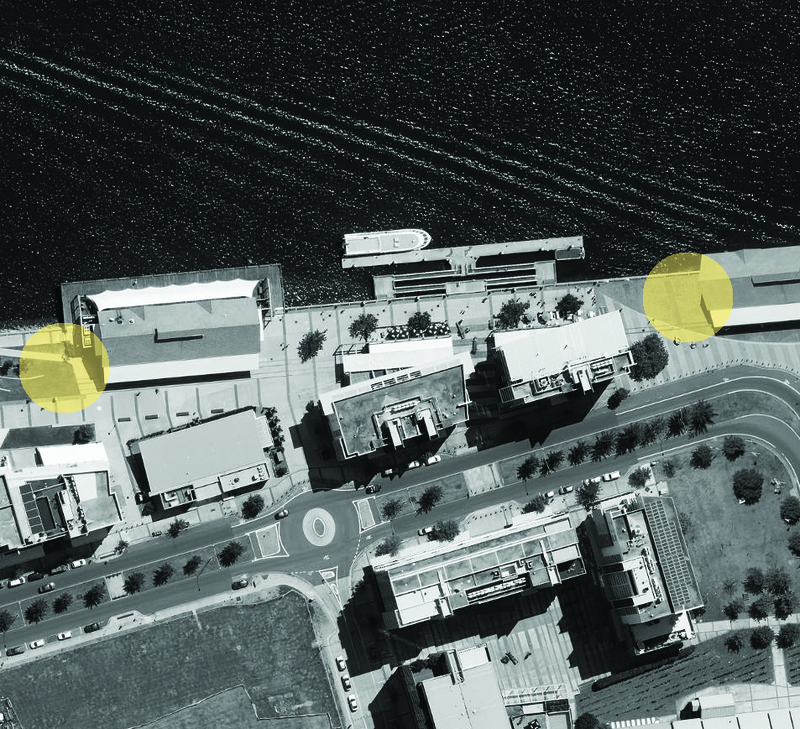 When the opportunity arose to design and install an outdoor cooking and dining area in the Honeysuckle Precinct through NSW Government funding, some terms had already been established, but the overall concept aligned heavily with Amber's research. The Moveable Feast was designed to reflect, respond and engage to the conditions presented by Honeysuckle as a public area - while offering contributions to environmental, community and local tourism. It was pitched as an integrated garden and public dining table to host eating and growing events, with a heathy eating/ healthy environment focus that aimed to increase sociability and interaction amongst the people within the honeysuckle area. When determining the most important functionalities to all intended users (not just those at risk of food insecurity), current resources utilised in the public realm were identified, as well as gaps. The purpose of this study was to combine the most important aspects into one convenient unit. Aside from functionality; durability, portability, traceability and maintenance issues needed to be addressed. With a 12-month minimum lifespan, it was important to recognize that the project would be a working prototype. It was decided that although stainless steel framing would be ideal for a long term project in close proximity to the ocean, galvanized steel would suffice, given the budgetary constraints and short timeline of the project. Similarly, although many superior materials could have been selected for the external panels and shelving, plywood was used due to its low cost, and ease of replacement. This was also in recognition of the potential for wilful destruction or damage. The design was assessed and signed off by a structural engineer, as public safety and liability were important considerations. Given that the design needed to be portable, a modular approach was taken. This allowed the units to be moved with relative ease (the Moveable Feast can be installed and set up by two able bodied people of average strength, using provided dollies which are then housed within the units). A self-stopping tap was used in conjunction with a holding wastewater tank and decanting wastewater tank. The tap allowed 10 seconds of water before turning off. This meant that only one potable water tap was required, which was connected to the tap with a hose, and that no permanent sewage outlet was required. Theft was also a consideration, which was addressed in a preventative sense by adding joiner pieces, which caused the portable components to be too large and cumbersome to be easily moved or stolen. Obscured GPS tracking devices were installed into key components of the assembly. This allowed a computer to send a text message to the GPS tracker, which would then send a text reply consisting of the GPS coordinates of the GPS locator, in real time. If a unit containing a GPS was stolen, this would allow it to be located and possibly retrieved. Though this was theoretically worthwhile, logistically it proved difficult due to the locators needing to be recharged often. The installation required periodic cleaning and maintenance. The unit itself was cleaned and had the garden watered once per day, with the tanks emptied once every two days. Though there was an expectation prior to the installation that there may be some wilful destruction or waste left behind, the installation periods were quite uneventful in that sense. There were cases of discarded food scraps and garden waste (the discarded ends of shallots, for example), however thorough cleaning only had to be carried out for the cooking surfaces. A future iteration includes installation outside of the Honeysuckle precinct at a new location, with added functionality, such as a mobile phone charging station and a chalkboard mural which will enable the public to take more ownership of the Moveable Feast by participating in decorating the vertical exterior panels. Ideally, in the future it would be heartening to see a more permanent structure put in place for public use, with the same, or similar functionality. The ability to prepare food in a public space provides an opportunity for those most at risk of food insecurity to vastly improve their circumstances in an autonomous and dignified way, free from stigma and judgement. This project is funded by NSW Government and a research project of the University of Newcastle.